This final chapter of the Salzburg travelogue is writen about a part of the city I completely overlooked in my winter 2002 trip because little was going on. 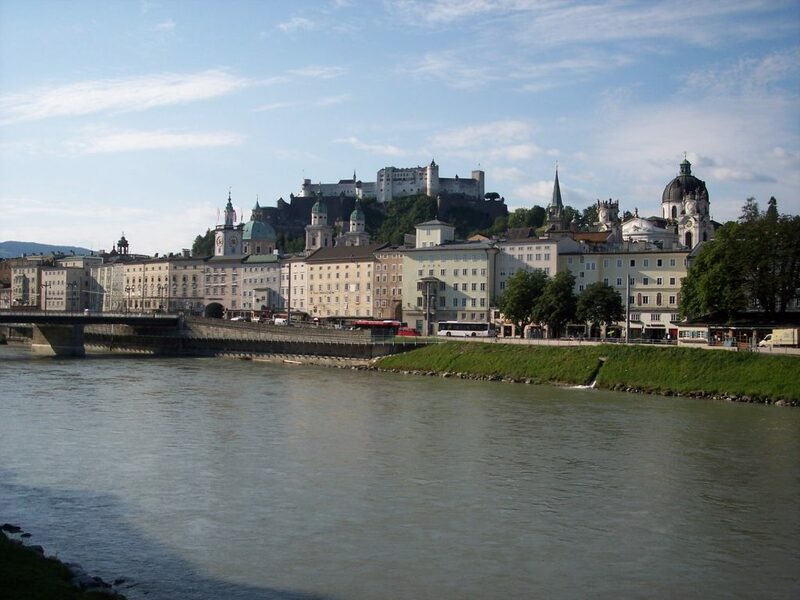 The north-central part of the city, sitting on the inside of the bend in the Salzach, contains the Schloss Mirabell and the Mozarteum University, which are perhaps more exciting when the students or tourists are in town. It certainly was different when I visited in the summer of 2008. First, I will provide the lay of the land. If you arrive by train, you are likely to pass by this part of the city heading to the Alstadt, shown in the first photo above from the north bank of the Salzach. The Salzburg train station is located just to the north, and the most direct route is following the Mirabellplatz road that passes by the Schloss on a straight line to Makartplatz and Mozart’s downtown living quarters near the University. Another block and you reach the scene above. There are a number of other points of interest in this region. 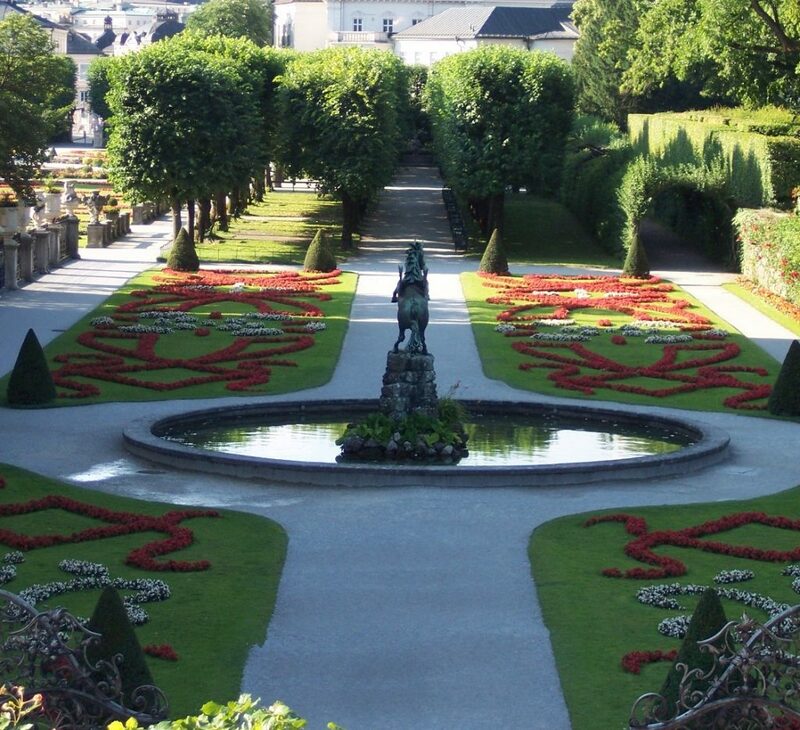 I already mentioned the Mozarteum University, named after Mozart of course, as was many other places in Salzburg. Mozarteum U. is a conservatory and fine arts school that, according to its 2017 website, calls Mozart its “inspiration” in guiding young musicians to excellence. Not surprisingly, the University owns or lends its names to several theaters and museums nearby. 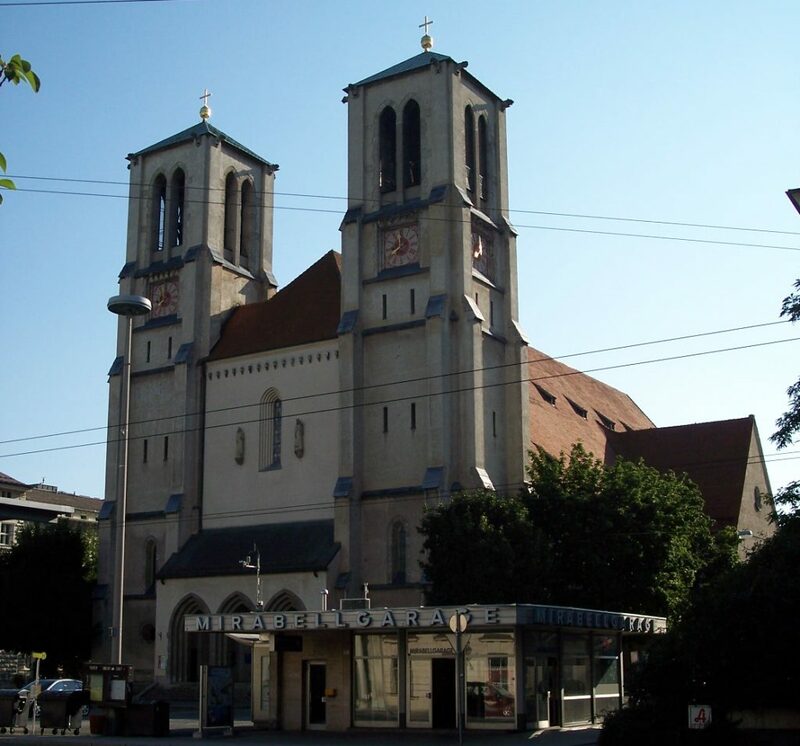 There are also two major churches — the massive Holy Trinity Church which is directly across from the University and the Church of St. Andrae shown in the third photo above. Numerous big hotels (not necessarily chains) and a pedestrian walkway loaded with restaurants and cafes follow along to the east toward the base of the Kapuzinerberg. I didn’t get the chance to stop there, though — had plenty of other city to get to. 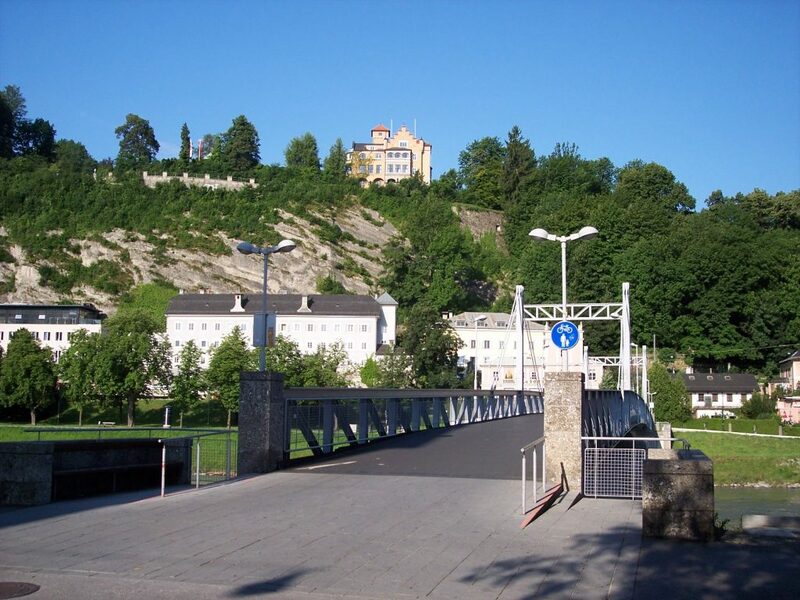 The fourth photo shows one of the walking bridges, the Muellnersteg, located further down river to the northwest. This is getting close to where the train tracks cross the Salzach into the station. I took this photo to show: (1) how nice their walking bridges are, and (2) the ElizabethKai promenade that follows in the background. The Altstadt is around the bend far to the left from here, but the promenade follows the length of the south bank to it and it was a terrific walk along the base of the Moenschberg ridge. The Hotel Schloss Moenchberg appears at the top — you could also walk the ridgeline up to the Hohensalzburg, I understand, but I didn’t try it. The final photo was taken toward the latter stages of my trip as I made my way back toward the train along Mirabellplatz. This summer day happened to be the occasion of Salzburg’s Love Parade, a celebration of the LGBT community, which I believe was being held in conjunction with the annual summer fair (my memory isn’t so strong). 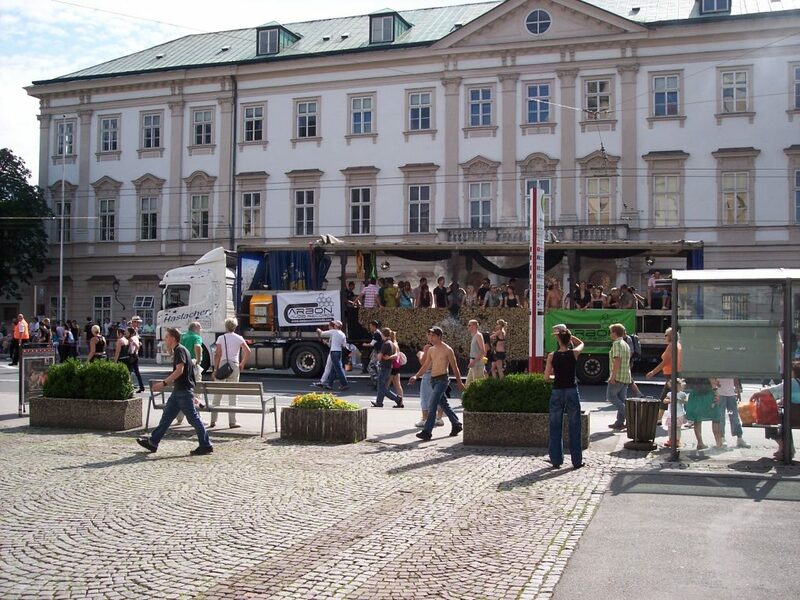 At mid-afternoon, truckloads of young people like the one shown convoyed down the street to the Makartsplatz for an open air concert. The summer fair was very crowded and hot — the temperatures were well above 30 degrees C that afternoon, which is unusually hot for Austria, but that didn’t deter the attendees. The convoy ended about where the photo was taken, right in front of the Schloss Mirabell, and off they went. Love Parades were a feature of German and Austrian life at the time, when many LGBT celebrations were making the rounds from city to city. And so that concludes the travelogue on Salzburg! Thank you for reading. Keep visiting for more travelogues!